Whether you choose fixed panoramic windows, tilt-turn windows, parallel opening aluminium windows or casement windows, you can rest assured that they are all designed to offer uncompromising performance and stunning aesthetics. Choose from a comprehensive range of designs across a range of panoramic window types, including fixed windows, tilt and turn windows, parallel opening windows and casement windows. 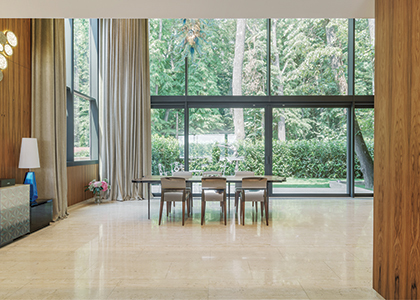 Reynaers at Home opening panoramic windows are fitted with a state-of-the-art multi-point locking system and our internal glazing bead prevents the removal of the glass from the outside. Combined with some clever design, this means our aluminium window systems are amongst the most secure on the market, meeting and often exceeding the requirements for some stringent British and European security standards. 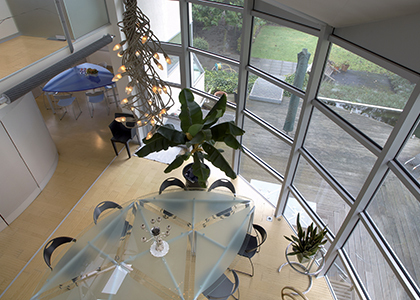 The extensive range of CW 50 and CW 60 panoramic windows offers different solutions, allowing the use of triple glazing making the facade applicable for passive houses. In addition to that, dedicated opening types can also be seamlessly integrated; like a parallel opening window, a top hung window, a hidden vent turn and tilt window, also a flush roof vent for integration in roof applications of CW 50and CW 60.